Technological innovations in the use of nutrients, such as nitrogen and phosphorus, to produce food are related to the great global increase in population, life expectancy, and economic prosperity experienced in the twentieth century. 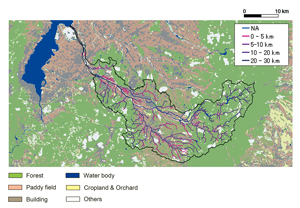 Overexploitation of nutrient resources leads to disturbance of natural biogeochemical cycles, however, contributing to significant eutrophication in almost all watersheds with densely populated areas (Photos 1, 2). Such nutrient imbalances are a main driver of biodiversity loss on a global scale. It is now recognized that nutrient imbalances and biodiversity loss are prevalent throughout the planet and pose a risk to sustainable human development. 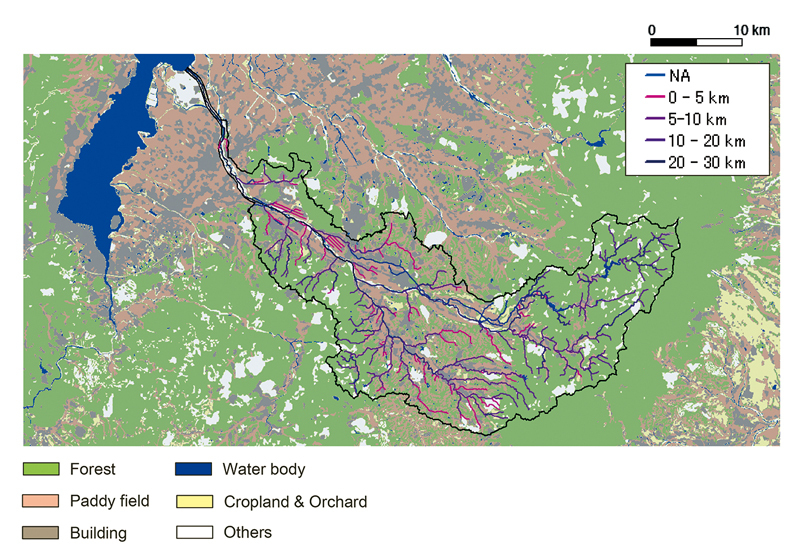 In order to solve these problems related to nutrient imbalances and to ultimately construct sustainable social-ecological systems, we have to enhance nutrient recycling on watershed scales. Although many governments have adapted nutrient management practices, most are unsuccessful because top-down policy or scientific approaches often do not resonate with local community experience. We therefore need to develop governance practices based on exchange between stakeholders and the integration of local and scientific knowledge to solve social and environmental issues specific to local communities. 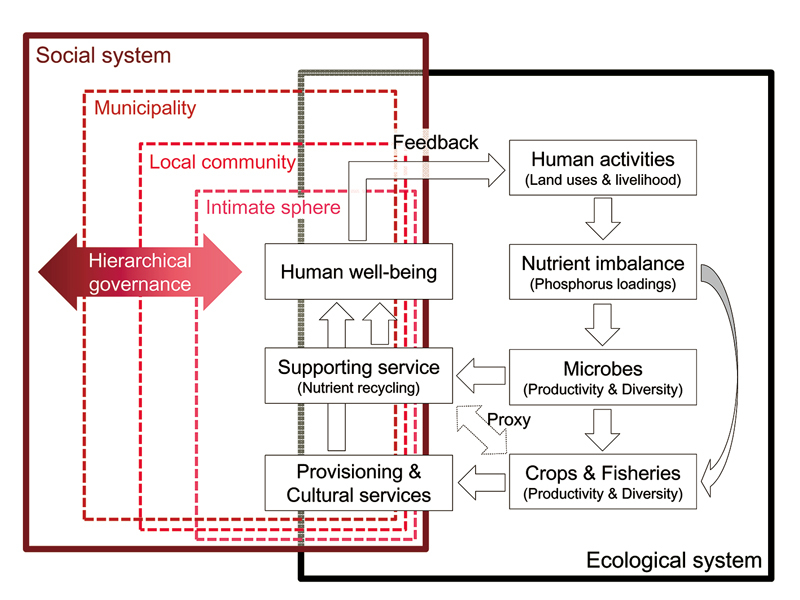 Such community-based governance, if practiced in many places, may result in the solution of issues related to nutrient imbalances found on watershed scales. In this endeavor, project research aims to develop a framework for adaptive watershed governance that takes account of how biodiversity, nutrient recycling and human well-being are altered through community activities. In this way we hope to improve the strategies used to increase these response variables through the PDCA cycle, according to approaches of transdisciplinary science (Fig. 1). Our hypothesis is that human activities affect biodiversity through alteration of nutrient balances, while biodiversity affects human well-being through alteration of ecosystem functioning and services (Fig. 2). 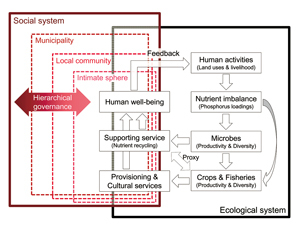 According to this hypothesis, we work in a transdisciplinary process with a variety of stakeholders to integrate local and scientific knowledge on adaptive watershed governance directed towards increasing biodiversity, ecosystem services and human well-being. 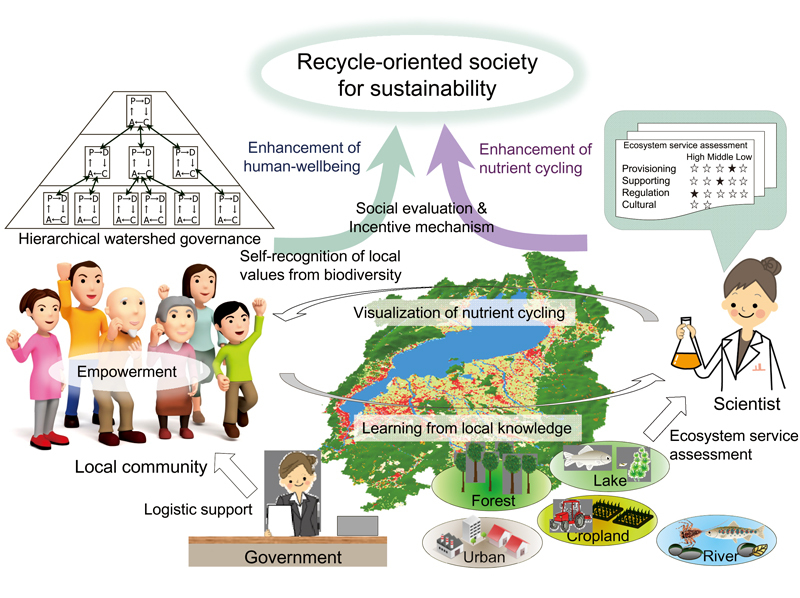 In order to empower citizens in watershed governance, we introduce some methods to visualize how nutrient recycling is enhanced through community activities. To motivate stakeholders, we also evaluate how numerous ecosystem services are derived from biodiversity. We will also develop a new method to evaluate human well-being in local communities, as it is closely associated with site-specific cultural services. We expect that such a context-dependent description of human well-being will enhance the sense of community created through collective recognition of locally unique values. 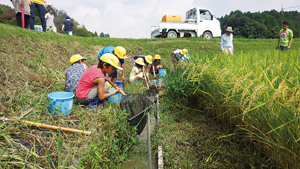 A preliminary field survey was conducted in the catchment of Yasu River, the largest tributary of the Lake Biwa Watershed (Japan). 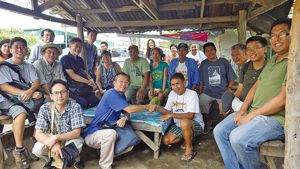 We selected four local communities as models for community-based governance from upstream, middle-stream, downstream, and coastal area of this sub-watershed. Through dialogue with local communities, we focused on local community activities which have the potential to enhance biodiversity and nutrient recycling. 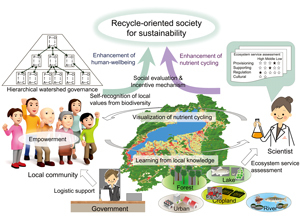 Preliminary observations and experimental studies demonstrated that local knowledge-based activities are indeed likely to be useful in enhancement of biodiversity and nutrient recycling. We have also established three techniques to visualize biodiversity-driven nutrient recycling. The first is nutrient spiral metrics, which indicates how watershed ecosystems metabolize nutrients (Fig. 3). The second consists of phosphate oxygen isotope analysis in order to trace phosphate cycling in aquatic and terrestrial ecosystems. The third is a molecular technique to characterize microbial diversity and functions of nutrient recycling in ecosystems. So far, these techniques reveal that our hypothesis on nutrient-mediated human-nature interactions can be partly supported. They also allow us to do comparative studies in other ecosystems. On entering the period of full-research, we organized seven discipline-oriented research units and twelve site-based or issue-based working groups, which are composed of a total of 83 collaborators. Comparative examination of four other watershed systems in Monsoon Asia, three in Japan (Lake Shinji, Inba Marsh, and Hachiro Lagoon) and one in Laguna de Bay, Philippines, allows us to consider the generality and specificity of adaptive governance in relation to social, cultural and geographical features (Photos 3, 4). Disseminating our research outcomes, we also want to expand the research network related to nutrients and watershed governance, especially in other developing countries in Asia.